Sign up to receive a free 3-day sample of Nestle Nido 1+ Powdered Milk. Allow 4-6 weeks for delivery. One sample per household. 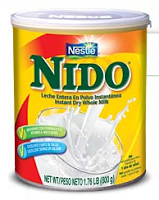 You’ll also have an option to print a $2 off Neslte Nido coupon. Please send me sample. Thanks! Sorry, but this deal expired back in 2011.